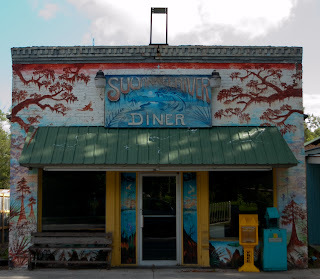 This diner is located in White Springs, FL. I have a habit of taking building fronts from the driver's seat. I don't know if this place is still open for business or not. I was born in Suwanee County, FL and this river, and the St John's are the 2 rivers I have a strong connection to. I've posted some photos of the origin of the Suwanee River located in the Okeefenokee Swamp on my facebook page, if interested there's a link to the left of this image.